When we think of a Stallion words like strength, grace, aggression, unbridled and beauty come to mind. CWI Woodworking Technologies has developed Stallion Sawing Equipment with these attributes as part of its DNA. A Stallion band saw will offer its owner a machine with impressive attributes that will allow him/her to tame any woodworking project with ease. 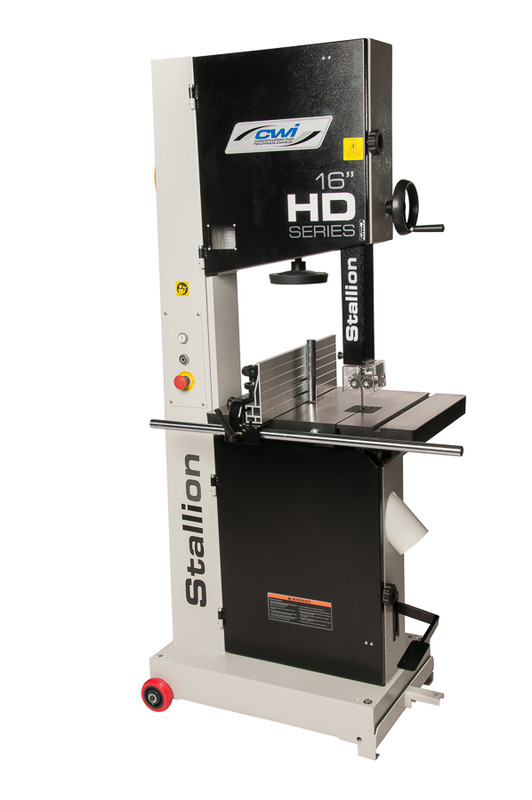 The Stallion HD Series of band saws with 16” to 24” cutting and resaw capacities are extremely well built machines with very heavy duty features but at a value that will impress any woodworker. The Stallion CWI-B1611 16” HD Series band saw is built in our factory who also produce machinery for many of the popular European companies in business today. It is a true workhorse of a bandsaw with a European influenced design and features and benefits that will rival many saws at double the price. The CWI-B1611 offers 11” of resaw capacity, a heavy duty double welded steel frame, 4 HP single phase motor and solid cast iron disc (not spoked) 16” wheels expertly balanced on sealed for life heavy duty bearings. A large bristle brush is mounted on the lower wheel to help keep the tires clean and extending their life. The work area is a 16.5” x 22.75” heavy ribbed cast iron table sits atop a heavy steel trunnion system with rack and pinion adjustment for up to 45 degree tilting of the table. A 3/8” x ¾” miter guide slot is standard for use with most miter gauges. The heavy duty double ball bearing blade guides are robust and easy to adjust for any sawing needs from fine finish work, veneer cutting or heavy resawing. Bandsaw blade changes are eased with the help of a hinged blade guard above the bandsaw guides. The guides easily rise and fall with use of a large hand wheel and a rack and pinion drive system. On the back of the machine is a large lever that when pulled will release the tension on the blade for faster blade changes and for extending the blade life while the machine is not in use. A Stallion “Drift Adjust” cast iron body with 6” tall aluminum rail bandsaw fence allows for simple tool less adjustments to compensate for blade drift. A resaw drift bar is also included on the fence. A blade tension indicator is standard for up to 30mm blade width. Safety features include magnetic safety switch with overload and under voltage protection and micro switch protected doors which will not allow the saw to start if the doors are open or if the door is opened during operation the saw will shut down. A foot brake to speed stopping times is also included and features a safety micro switch that shuts off the power when activated. Also a really nice feature is the LED light bar which lights up the entire work area with very bright light…..a really nice feature for older eyes. The saw also features a mobility kit as standard to make movement in the shop a breeze. Dust collection on the Stallion HD band saw is easily performed with dual 4” dust inlets. The side inlet which sits just under the lower blade guides has a wooden insert to help capture most of the dust before entering the frame of the saw where the second 4” inlet is placed. The Stallion HD Series of Band Saws are truly in a class of their own, built with the attitude, grace, strength, performance and beauty you would expect….from a Stallion!